Jonathan talks about how some people think NASA never went to the moon and his thoughts on the matter. Todd: So one very popular conspiracy theory is the moon hoax. Jonathan: Yes, that's always a very funny one to hear people talk about. They saw this one program on Fox which had five or six points which look so impressive, you know, when you've got the guy from Star Trek presenting them, and then now they believe it to be complete truth. Something like thirty percent of Americans now believe that the United States never went to the moon. Todd: So let's go through these points. And you can refute them. What are some common points that are brought up? Jonathan: People talk about the flag. 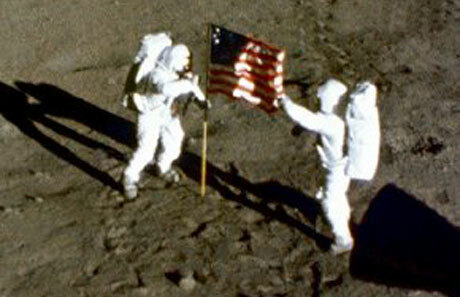 That the flag is waving on the surface, and they say, "Well, there's no atmosphere on the moon. The flag wouldn't be waving." But of course the reality is if you see the entire footage, the astronaut takes some time to plant the flag on the surface. His hand is moving about, so of course the flag, which is connected to the pole, naturally moves about. When the astronaut steps away from the flag, you'll see that it hangs completely limp in space. Todd: Ah, right, that makes sense. The what about the argument that when they took photographs, you can't see stars in the background? Jonathan: I'm not completely familiar with this one, but I remember there being a lot of talk of strange shadows that didn't line up or alternate light sources, when people said, "Oh, there should be other light source in that case." I believe though that was not taken into account was the fact that the moon itself can reflect light is such a way that serves to be an alternate life source .... sorry a light source, and that way it can explain the different shadows and the non-visibility of the stars. Todd: Then what about the one about the blast crater? People say that there should be a big blast crater? Jonathan: Yes, were the jet engine of the rocket would have lifted off. Again from what I understand, in that atmosphere and the force of the engine with the make-up the surface of the moon, this was completely overstated point. In fact, when this program on Fox originally aired, which got everyone talking, NASA thought it was so ridiculous, they they didn't even respond to these points, which actually I guess made the conspiracy theorists think, "Ah-ha! NASA was afraid." Whereas the reality was they just thought it was all a big joke. It wasn't until later that some magazine like a mechanics or scientific magazine took the time to completely destroy their argument line-by-line. If you see the entire footage, the astronaut takes time to plant the flag. Coaches always review the entire footage of a game. The director's cut allowed viewers to see the entire footage of the movie. The flag hangs completely limp. The boxers were so tired, their arms hung limp at their sides. The student was so deep in sleep in class, his head hung limp on his chest. They did not take into account that the moon is a light source. When planning a trip overseas, you should take into account the customs of the country you are visiting. Good teachers take into account the learning styles of all students when preparing lessons. They did not take into account the make-up of the moon's surface. The make-up of something is the composition of something. It is the collection of everything that makes something. The make-up of things can be physical items, while the make-up of people can be character traits. He has the right mental make-up to be a good police officer. The make-up of the desert soils is too harsh to grow plants. NASA thought is was a big joke. When something is a big joke that means people do not take it seriously and perhaps think something is silly or unprofessional. If you say someone is a joke that means you do not respect that person. Our new boss is a joke. He does not know what he is doing. The party was a big joke. It was poorly planned. Did NASA actually go to the moon? Shirley talks about being a custom official. A holiday that's more famous abroad. How Mexico celebrates its independence. People think the new law is a . The dog walks with a leg. We saw old of the first World Cup. You need to that it might rain. The of the Earth and Mars is very similar.